Applied Micro announced X-Gene 64-Bit ARMv8 Server-on-Chip at ARM Techcon 2011, and later in 2012, they showcased Apache2 on an FPGA implementation of the chip. More recently, they showcased KVM (Kernel-based Virtual Machine) on their X-C1 hardware platform with an actual X-Gene SoC at Linaro Connect Europe 2013, and Linaro has just uploaded the video of the demo. 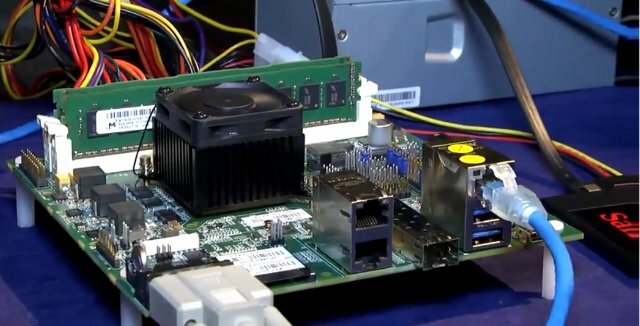 The development board features 8 ARMv8 64-­bit processors, PCI network, up to 6 SATA drives (but only one used in the demo), and they also have hardware fitted into a 1U rack. The demo below runs 4 SMP Linux virtual machines (with 2 VCPUs), including 2 ARMv7 32­-bit, and 2 ARMv8 64-­bit guests, running web servers concurrently on each VM using VirtIO-based network virtualization. Cool! But what are the chances that they will make a board suitable for home use? I don’t need something crammed into a 19″ rack-mount case (although I do actually have a 19″ rack) or multiple 10G Ethernet. I think in the first few years, the chances of getting a system for home use based on 64-bit ARM are remote. But who knows, I may be proven wrong.